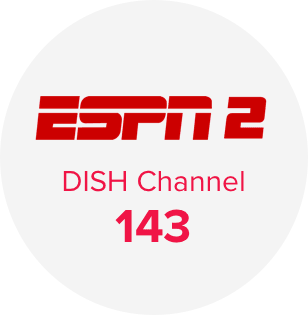 ESPN2 is on DISH Channel 143. Join the 95 million1 other sports lovers who tune into DISH channel 143 for 24/7 ESPN2 action. 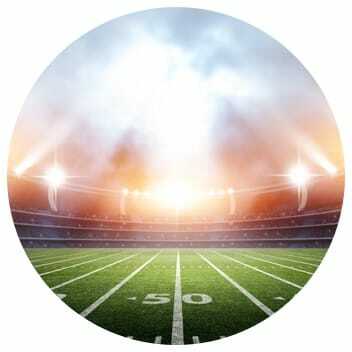 A sister channel to ESPN, ESPN2 brings you access to Arena Football League, Major League Soccer, Poker, Grand Slam tournaments coverage, and ESPN First Take. Order America’s Top 120 or higher to enjoy ESPN2 in your subscription. If you love a variety of sports, catching all the games you want can be difficult. That’s why Hopper 3® from DISH has advanced functions that let you watch several shows on the same screen. Use MultiView or Picture-in-Picture to keep your head in multiple games! Stay connected to the highlights, news, and analysis of the sports you love with ESPN’s flagship program. Hear the latest sports topics debated by Molly Qerim, Max Kellerman, and Stephen A. Smith. 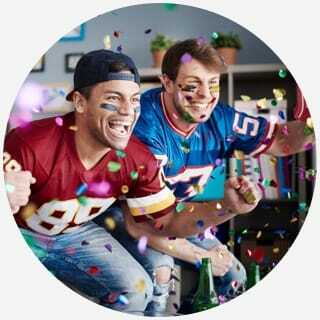 The traditional TV every diehard knows, Monday Night Football features highlights, recent scores, and broadcasts in Spanish! Watch world championship auto racing from practice to qualifiers. Get access to the Australian Open, the U.S. Open, Wimbledon, and the French Open. If you’re a diehard, you probably need more in-depth sports coverage. Bring the action into your home with Sports Packs from DISH. Choose from a variety of packs to enjoy out-of-market NBA and MLB games, coverage of major networks, and international sports. 1 TV by the Numbers, "List of how many homes each cable network is in as of February 2015"